“People are here!” Maggie yelled to her dad, June’s basketball coach, as I entered the gym with June and Talia for Friday afternoon practice. June and I had picked up Talia in the parking lot where her mom was stranded in the car with her napping younger brother. Other than Maggie, they were the first players to arrive, but soon everyone else was there and the gym was filled with the sounds of sneakered feet and bouncing balls slapping against the wooden floor, as well as the shouts of seven- and eight-year-old girls. The Pandas were psyched. After practicing the line dance that is supposed to help them with their pivots and other footwork, and the passing drills, and the scrimmage, Coach Mike gathered the team for a final huddle and their traditional cheer, “Hustle, hustle, hustle, Pandas!” It’s positive and to the point, like Mike himself. He’s the kind of coach who can pull this kind of thing off: once when the players were glum during a losing game in kindergarten (a year in which they lost every single game), he told them gently, “That’s not the Panda way,” and to a player they all perked up and looked heartened. He’s that good with them. Mike had instructed all the girls to wear their team shirts to the game. They’d have an on court high five with the home team, the Blazers, at halftime, he said. He spotted us as we were buying tickets for the adults (kids in basketball league t-shirts got in free) and urged us to stay at least until the end of halftime. He knew we’d be taking June home early because we are strict about bedtime. I assured him we would. We found the Pandas and assorted parents and siblings and took our seats, then made a snack bar run. June studied the Starburst ingredients list to see if they were vegetarian (no dice, gelatin) and then checked out the Swedish fish (success!) while Megan got a Rice Krispie treat and a couple other things. She asked if she could come back later to get something for her little sister. She had four dollars and she wanted to spend as much of it as possible. 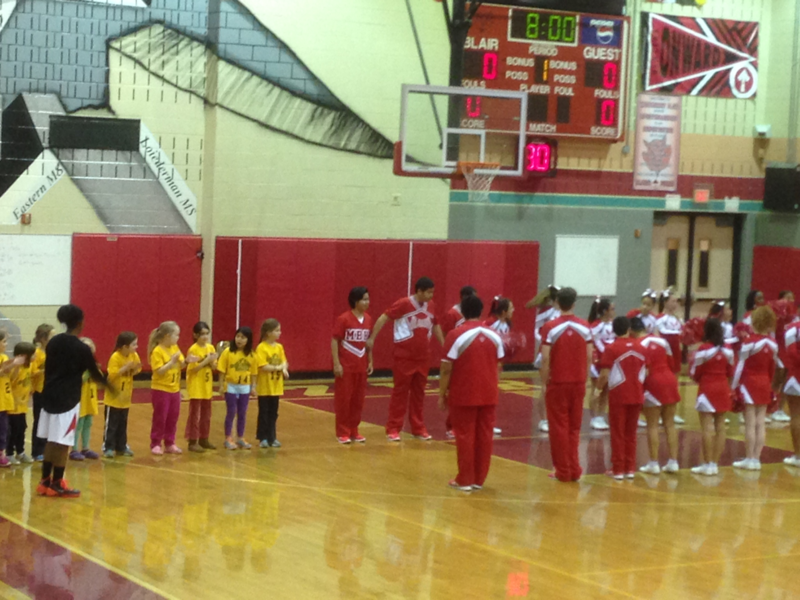 Before the game started, Mike led the Pandas onto the court and they were introduced on the loudspeaker as “The Golden Pandas and future Blazers.” The Pandas stood next to the cheerleaders as the high school players were introduced one by one and ran through the double line of cheerleaders. That would have been enough excitement, but there would be more. The game started and, not surprisingly, it’s much faster than elementary school basketball. 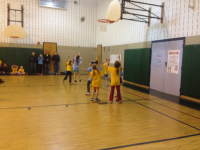 We all admired how the players instinctively knew where the ball was and where to pass it and that they could get baskets from pretty far away. I know in organizing the trip, Mike wants to show the girls where they could be in seven years, at least those of them who really will be future Blazers. The Blazers were winning 26-19 at halftime. The Pandas walked down the edge of the court, getting high fives from a line of cheerleaders and then disappeared through a door. When they returned half of them were wearing Blazers t-shirts over their Panda shirts. They were going to scrimmage! 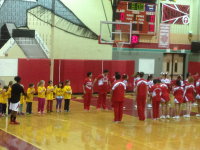 They were the halftime entertainment! Mike told them only moments before it happened and didn’t tell the parents at all. For the record, those empty bleachers you can see comprise the seating area for the opposing team. The home team side was close to full. “It was like we were the guests of honor,” June said. “We were!” Megan said earnestly. Then June allowed humbly that before most of the people in the crowd got there, they hadn’t heard of the Pandas. Fortunately, that situation was now rectified. Next we discussed the Blazers’ game and the strengths of various players. This conversation was somewhat impeded by the fact that Beth could only identify players by their jersey numbers while both girls relied more on the players’ hairstyles. I walked Megan to her door, explained to her mother how she came to be injured, and then we drove home. The next day was the Pandas’ first game. 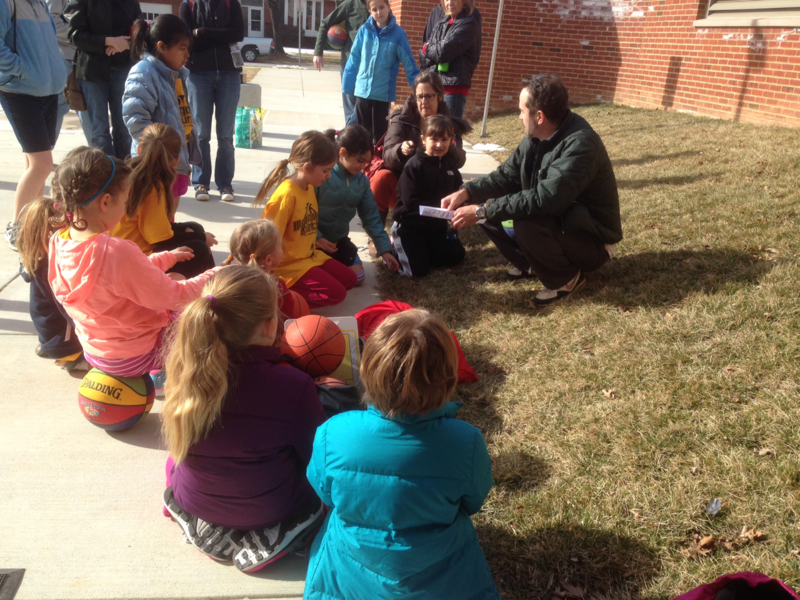 Before the game, the Pandas bounced balls on the sidewalk outside the school and huddled and Mike asked for thoughts. It doesn’t matter who wins, someone offered. Mike said it didn’t but it did matter that they hustled and did their best. And had fun, another player suggested. Yes, have fun, too, he agreed. 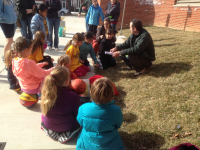 If you haven’t been in an elementary school gym recently, a common configuration is two eight-foot basketball hoops along each of the long sides of a rectangular room, and a ten-foot hoop on each of the short sides. That way you can play two games simultaneously with the short hoops or one full-court game with the tall hoops. In kindergarten and first grade, they always used the short hoops and they’d been practicing on them all January, but this gym did not have enough short hoops. Someone came with a long-handled tool and tried to lower the hoops but it didn’t work, so the coaches decided that instead of splitting the teams in half and playing two games, they’d play on the full court, with the tall hoops. The Pandas started warming up and throwing balls at the tall hoops. A lot of them were going in, and not just Sally’s. June had that serious look she gets on her face when she is determined to do something, but none of her shots went in. Overall, though, the Pandas looked good. But every now and then I glanced over at the girls in the light blue t-shirts practicing on the other side of the court, the Dolphins, and I noticed their shots were going in, too. At first, the teams seemed pretty evenly matched. I think the score was tied, or at least close, at the end of the first quarter. But after that, the Dolphins hit their stride and they scored basket after basket after basket. Beth thought June looked tired, even though the fact that they were playing only one game meant all the players were sitting out half the time. I pointed out she’d been up an hour past her bedtime and I wondered if the whole team was tired from the previous night’s adventure. By my count, the final score was 14-2, but Beth thought the Pandas scored twice and she might have been right. The Pandas didn’t lose heart, though, and they minded their manners. After Sally scored the first (and possibly only) basket of the game, Talia took the time to hug her, and when Lila tripped over an opposing player right before the final whistle, I saw her say, “Are you all right?” before getting back into the game. This entry was posted in Extracurricular Activities, Friends by Steph. Bookmark the permalink.